WHAT'S THE BEST GIFT FOR THE PERSON WHO HAS EVERYTHING? Save a life in their name this holiday season! 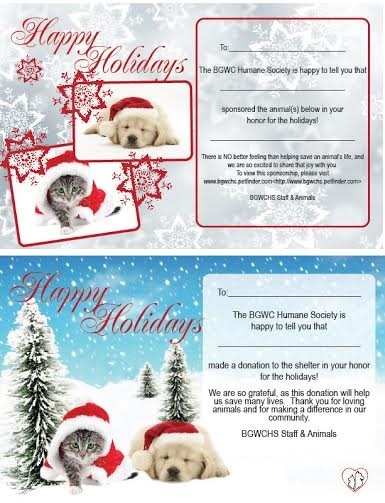 Make a donation to the BGWC Humane Society or sponsor an animal and we'll send your friend or family member a holiday card to let them know about the gift. Stop by the BGWC Humane Society or call us! You can choose any amount!